Clans are ongoing military unions of players created for co-operative accomplishment of military missions, geopolitical games, or just for fun. Only clans can control provinces on the Global Map and receive regular income, initiate diplomatic negotiations, form alliances, and participate in clan tournaments and rated combats. Clanmates are brothers-in-arms who fight shoulder to shoulder for victory or share bitter defeats. You can become part of one of these clans in World of Tanks. Go to the game's website for the server you play on. Log in and then click on your Log-in name in the upper right corner to display the drop-down menu (see image below). Click on My Profile. This will take you to your Profile page. There you will see "Find Clan" listed as one of the options on the right side. Click on that. Now you can either scroll through the entire list of clans or, if you know the *correct spelling* of the clan name, you can just type it in and press Enter. When you find the one you're looking for, click on Join Clan. This will bring up a text window where you can type a message indicating your interest in joining the clan, why you chose that clan, etc. You will have to wait for someone to accept you into the clan. Once they do, you're in. Note that there is a 48h cool-down period after leaving a clan during which you cannot be accepted into another clan. If your application to join a clan is rejected, there is a 7 day cool-down period before you can reapply to the same clan. Log-in to your server's website and find your clan's page as described in the section above. Instead of the Join Clan link, as a member of the clan you will see a Leave Clan link. Click on that to leave your clan with immediate effect. This also starts a 48h cool-down period during which you cannot join another clan. Click on My Profile. This will take you to your Profile page. There you will see "Create Clan" listed as one of the options on the right side (See image below). Once you click on the Create Clan link, you will be taken to the next page (see image below). Name: This is where you enter the name of your Clan. This field is required and can be 2-70 characters in length. Please be sure to follow the Rules and Guidelines when choosing a clan name. Tag: This is what will be displayed next to your in-game nickname in brackets. For example: Carves [HOWTO]. This field is required and can be 2-5 characters in length. It can have Latin characters, digits, underscores, and hyphens. Motto: Self-explanatory. This field is required and can be a maximum of 100 characters in length. This field is required and can be a maximum of 1,000 characters in length. Once you have entered everything, you can preview it by pressing the Preview button. If you like what you see, go ahead and press the Create Clan button, and it will take you to the last confirmation page (see image below). 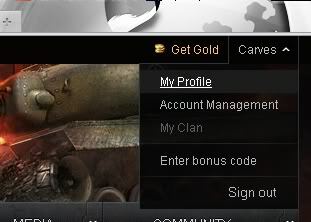 Upon pressing the Create Clan button, 2,500 Gold will be subtracted from your account. Once you enter your password, you will receive a confirmation that your clan was successfully created (see image below). 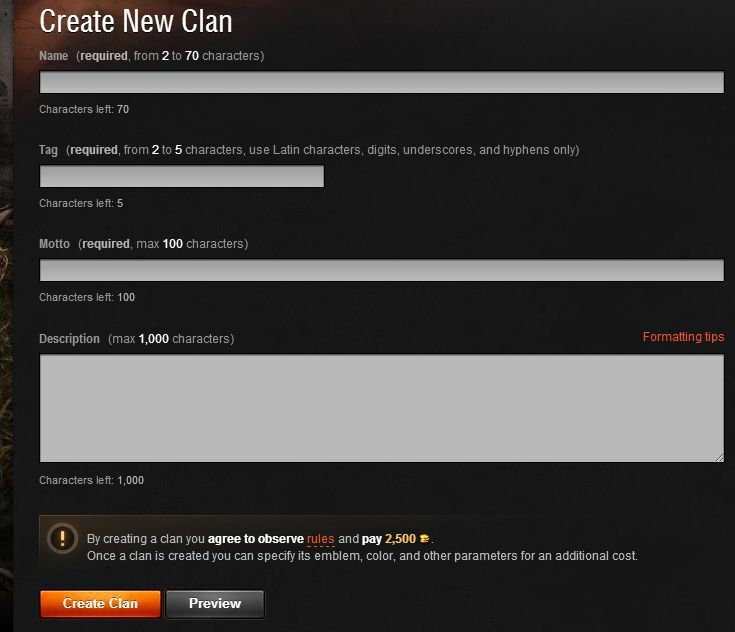 The information in this section about creating a clan was originally posted on the forums by moderator "Carves". Each title defines a set of uniquely rights. Rights can be granted only with the titles, separately changing right not to allowed. Everyone in the clan has only one title. Various titles can overlap rights that are given (as seen in the above table). The title “Commander” cannot be given, only transferred to another member. Clan commanders can be changed once every 24 hours. This cool-down is tied to the clan and not to the members who changed titles. The information in this section about clan member privileges was originally posted on the forums by the Dev "mediahead".